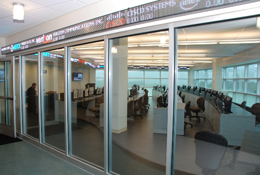 To improve students’ financial literacy and to bring a real world reality to the concepts taught in such areas as Finance, Accounting, and Economics, the Anisfield School of Business (ASB) opened its new Global Financial Markets Trading Laboratory in the summer of 2010. With real-time access to the world’s financial data and state-of-the-art trading systems, the lab allows faculty members to give students valuable insights into how the financial and economic theories taught in the classroom apply in real financial markets. As students first enter the Trading Lab, they are struck by the bright colored lights of the ticker displays flashing financial markets information. Ticker displays are located both inside the Lab and outside the Lab. The displays provide financial market news, U.S. market indices, such as the Dow Jones Industrial Average, S&P 500, and Nasdaq, currencies, commodities and stock price changes in the top 100 U.S. stocks. The ticker information is provided by Rise Display, Inc., which receives the stock price feed from Reuters. The 1,400 square foot Trading Lab features 32 workstations that students use to access the resources that are used in the courses. The are 2 monitors connected to a personal computer at each workstation, with one monitor dedicated for instructor use, and the other monitor that is used by students to access the instructional software. There are 3 LCD television screens at the front of the Lab that is connected to the live coverage provided by CNBC, and is used by Faculty to display their teaching materials via personal computer, and other audio/visual devices. During the Fall and Spring semesters, the Trading Lab is open from 9am-5pm, unless there is a class in session. Trading Lab assistants are available to assist students access the software in order to work on course assignments.